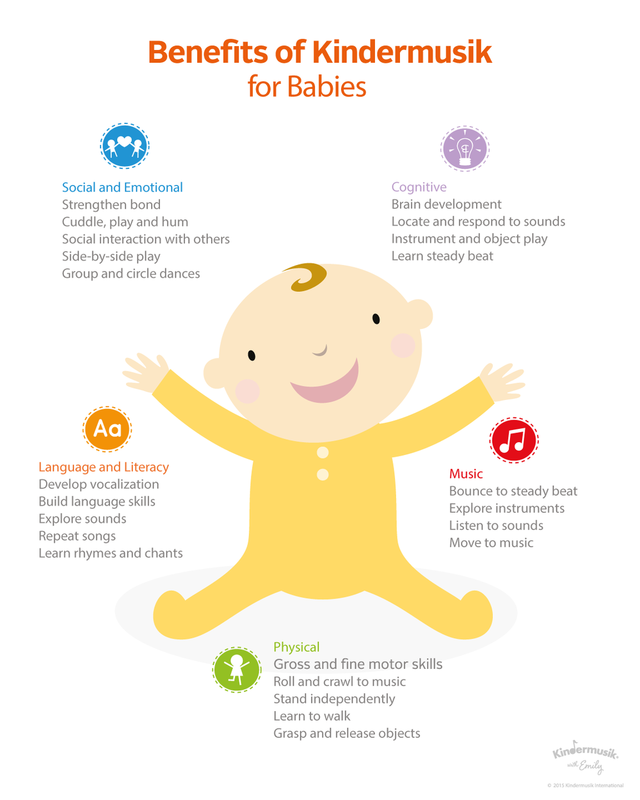 Music is one of your baby’s favourite things – AND it’s one of the best things for your baby’s developing mind. Babies’ brains are ﬁlled with billions of neurons just waiting to be connected through sensory stimulation. That’s what we do when we’re in Kindermusik: we offer a sensory rich environment, complete with music, movement and fun, to create and strengthen baby’s neural pathways. Each class touches on every learning domain, creates special bonding moments, and begins to instill a lifelong love of music. Young children newborn to age 2 are primarily in a receptive mode of learning. With you there to nurture and engage your child, a babies music class gives your little one the perfect head start, musically and developmentally. Language Development – You’ll hear lots of sweet coo’s and goo’s before your baby’s first words, and Kindermusik activities will help you to develop your baby’s language skills through vocalisation in response to music, hearing their name in songs, and exploring sounds with their own voice. Vocal Development – Being immersed in an environment of musical sound becomes the precursor to actual singing. Vocal play activities inspire your little one to begin to coo, babble, and hum – the beginning stages of learning to use the voice. Cognitive Development – Little minds present a big window of opportunity, but a window that’s actually only open for a rather short time. Simple musical play activities increase your baby’s brain development by locating sounds though instrument and object play and feeling a steady beat. Fine Motor Skills – From discovering their hands to learning what those precious little hands can do, your baby will thrive on playful activities with you that give them practice in visually tracking objects and teach them how to reach, grasp, and release those objects as well as to transfer them from hand-to-hand. Social Emotional Development – At a time when your child is becoming attached to you and just beginning to make their first connections with other people, Kindermusik helps you strengthen the precious bond with your child through cuddling, playing, humming, and dancing, and also heighten the benefits of social interaction with others through side-by-side play and group dances. Musical Development – Whether you are bouncing your child to the steady beat or they are doing a fledgling “bouncy” dance on their own, your baby is primed and ready to benefit from an early introduction to music through exploring instruments, listening to sounds, and moving to music.